Home > Blog > Tips > What is SEO? What SEO is not. What is SEO? What SEO is not. 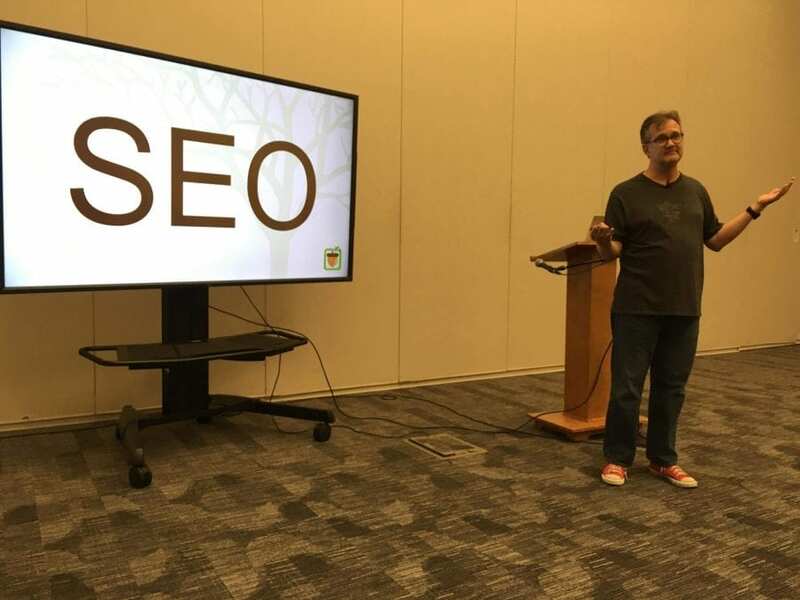 This is a partial transcript of a presentation I gave about SEO for WordPress sites at WordCamp Asheville. Even if you’re not using a WordPress site, I think you’ll find this useful. I don’t like the title to my talk [Stop It Now! Things Well-Meaning WordPress Developers Do That Hurts SEO]. It’s so negative. I think what happened was when I was pitching this I was having a rough week, because sometimes it feels like I get paid to fight developers. They say, “Oh, my God, here’s another SEO company to screw up my beautiful site,” and they don’t want to do it. So, everything I’m going to talk about today is from the perspective of companies who build websites for clients so that they can be ready for a productive SEO campaign. Now, every time I talk about SEO, I feel like I have to stop for a moment and define things. This is because every old fool on their LinkedIn profile says they do SEO. Every CMS promises to be SEO friendly. Every web host promises an SEO boost. Let’s stop for a moment and define SEO. It’s really simple. SEO, Search Engine Optimization, is about helping people find what you have to offer. Good. Now, in this case, they’re using the search engines to do it. But all we’re doing is connecting the person who’s looking with what the business has to offer. Now, SEO is not a few things. For instance, SEO is not all web marketing, right? Even my longest-term clients will say, “David, you’re our SEO, will you do our Facebook marketing?” Well, okay. I can do your Facebook marketing, but like that’s not SEO, right? That’s different. I can help you with your email marketing, but that’s not SEO. Let’s make a distinction between different kinds of marketing that do different things. In this case today I’m talking about organic search marketing, not paid marketing, not all web marketing. I’m talking about a specific way of marketing website through SEO. Second, SEO is not for everybody. SEO does a great job responding to demand. If someone knows your product or service exists and they’re looking for it, SEO might be a good solution for you. If your product is so new to market that no one knows its solution exists, if your product is so unique that no one knows to search for it yet, then SEO might not be the marketing solution for you. Let’s be realistic about what search can do. If that’s you, congratulations, you’re awesome. Hire a PR company. You don’t necessarily need SEO. You kind of need SEO, but don’t think that’s gonna create demand for something that people don’t know to look for yet. SEO is not trying to trick Google. Stop wasting your clients’ time trying to figure out what this week’s secret is, “And if you can just get the secret this week, you will dominate number one.” Baloney. There are certain basic things behind SEO that if you do, you’re gonna outlast the fool who’s chasing whatever is cool and hip this week, rather than doing the good best practices that will last. Don’t get distracted. Don’t waste your clients’ time chasing after the latest SEO fad or rumor that, “If you do this with your website and turn around three times real fast, your ranking number one.” No. Let’s focus on the best practices. And fourth, SEO is not set it and forget it. SEO done well is a long-term campaign and an investment in a website. And it’s not just because Google makes 700 algorithm changes a year. Because of the 700 algorithm changes, most people don’t notice any of them. It’s really because Google likes fresh stuff and you got to be maintaining a website and constantly updating it if you want to get there. There’re always more opportunities. We can’t just do SEO and walk away and call it SEO. There’s really never enough end to the number of things we could be doing to help market a website through search. Let’s not pretend that once you do this and you set up a site, “I’ve SEO’d it.” Congratulations. Bye. That’s not SEO. What are the basic elements of SEO? First of all, can you measure it? Second of all, can the search engines crawl and index the pages of your site? Third is, what does your website say? And last, who’s linking to your site? There you go. That’s SEO. It’s all we gotta do. When we’re building websites, we have to consider all four of these items. Next: How to measure an SEO campaign.